1. Is the treatment of monkeys in laboratories in Dane County humane? 2. What is needed to enable the retirement of monkeys from UW–Madison’s laboratories after they are used in experiments? 3. Is experimenting on monkeys ethical? The panel would then write a report documenting and explaining the Panel’s conclusions within six months of the Panel’s first meeting. Mention of Covance, the world’s largest importer and consumer of monkeys, with a lab in Madison using 7,000 monkeys a year, was almost immediately struck from the resolution. I’m Martin Cadwallader, and I’m the vice chancellor for research and the dean of the graduate school at the University of Wisconsin-Madison. The university is not in favor of Resolution 35 as currently written. However, the university proposes to increase opportunities for citizens of Dane County and beyond to learn about our animal research program, raise issues, and engage in dialog. To this end, we propose a series of forums that would involve research scientists, ethicists, veterinarians, and others engaged in, or interested in, animal research both on and off campus. The purpose would be to provide periodic opportunities to exchange ideas, become aware of the changing federal landscape in research, and provide an open forum on a broad range of animal research topics. The issues might include: Who funds research of this kind? 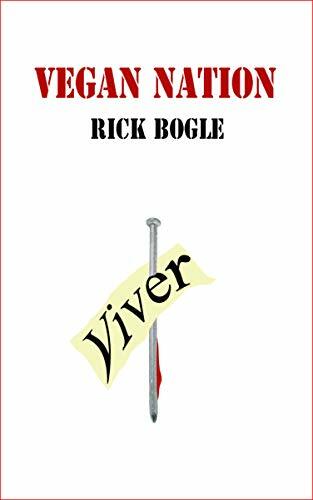 Are experiments involving animals necessary? Are there alternatives to using animals for research? 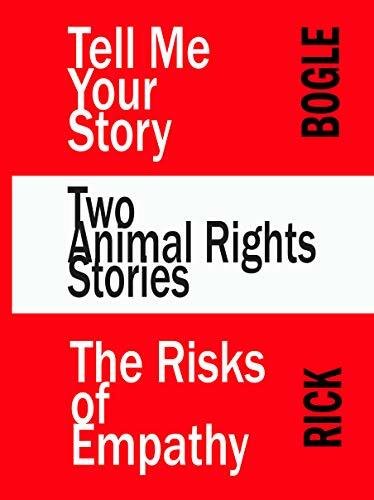 Who is looking out for the animals? What happens when animals are no longer needed for research projects? What’s the value of research with animals? In addition, we are committed to offering tours of our primate center, and we encourage you to take a careful look at our website on animal research which provides a great deal of information about the research underway at UW-Madison. It also provides information about our animal care and use program. Our aim is to make our animal research program more transparent to interested citizens, and to provide valuable information on the concerns and interests of our community. Now, over a year later, after the promise of tours turned out to be meaningless rhetoric, and after the fourth of the forums promised by Cadwallader, it seems fair to consider whether or not they have made their animal research program more transparent to interested citizens. The answer seems straightforwardly to be, no. The most recent event was held on October 11, 2011. 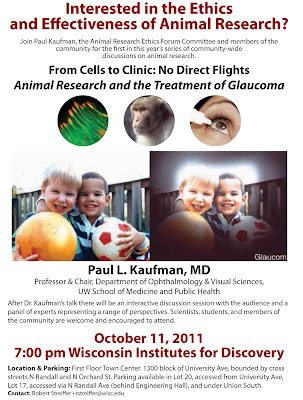 It was a lecture by Paul Kaufman, Professor & Chair of the Department of Ophthalmology & Visual Sciences at the UW School of Medicine and Public Health. 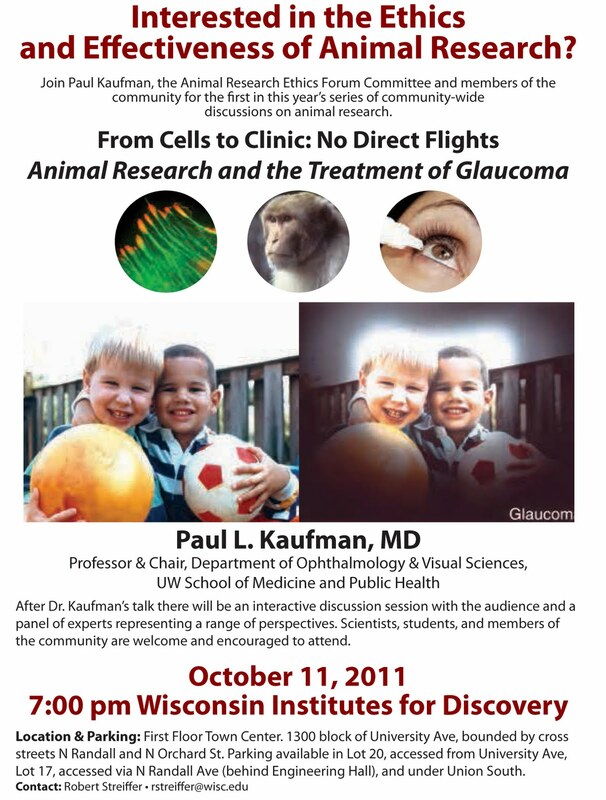 Dr. Kaufman uses monkeys in his glaucoma and presbyopia publicly-funded research. He may use and kill more monkeys than anyone else on campus. His methods are highly invasive. You can watch his presentation here. After his lecture, a three-person panel of UW faculty members made fairly brief statements. One of the panel members, Susan Lederer, Chair of the Department of Medical History and Bioethics, said that one of her areas of interest is the way animals are presented in science. (I know of only one paper by her on the topic, “Political animals: The shaping of biomedical research literature in twentieth-century America.” Isis, 1992. It’s well worth reading.) [She begins speaking at about 57:15.] She called the audience’s attention to the fact that Kaufman’s slides had included only one image of a monkey [it was the one used in the poster advertising the event] and included no details of what is actually done to the animals. She also pointed to Kaufman's use of the image of children in his presentation -- a persuasive device Kaufman left unremarked upon. I'd like Dr. Kaufman, if he could, to elaborate on one of the questions that Sue Lederer had, about what exactly is the experience, to the best that we can understand it, of one of the animals in some of the work you were drawing from here. Some of the slides talked about seven hours of treatment, one talked about five days of treatment. How long do you use them? What happens during the time you use them? And where do they go when your done? Kaufman responds to Lederer’s observation with the comment that he and Streiffer had decided that details and depictions of what he does to the monkeys weren’t appropriate for this lecture in front of a public audience. Lederer then apologized for her misunderstanding. At this point, Adjunct Associate Professor Patricia McConnell, another member of the Forum Committee, who was sitting next to me, leaned over and said that Kaufman’s explanation was contrary to what the committee had expected from him. Rob Streiffer, with microphone in hand, remained mute on the point. Kaufman's answer to Streiffer's specific questions comes at about 1:06:35, he wiggles this way and that, but finally says that there are strict rules and regulations on campus. That's the extent of his description of what is experienced by one of the monkeys he uses. A few days later, I talked with another member of the Forum Committee, Dawn Kubly, who told me that it was fully expected that Kaufman would explain what he does to the monkeys. She also said that this had been very clear in the committee’s discussions and that Streiffer had said so explicitly. Apparently, Strieffer had told the committee ahead of time that he spoke with Kaufman about the forum committee's desire to have him directly address the impact his research has on the animals he uses and the kinds of procedures they undergo. The hidden nature of the actual experiments is, of course, why the forums came about in the first place. Kubly was angry, and afterward wrote to the committee about Kaufman’s failure to explain exactly what he does to monkeys in the course of his experiments. Only one committee replied in any substantive way, and they agreed with her. This comes as no surprise. 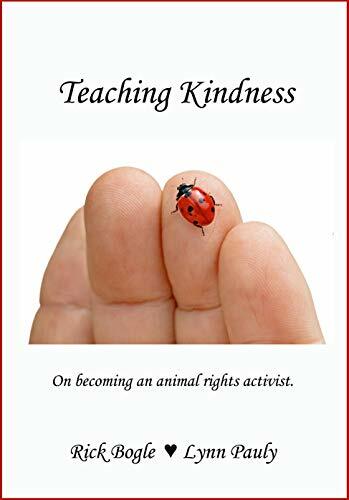 The university routinely lies to the public about its use of animals(1); it routinely works to keep the public in the dark(2); it actively builds barriers to public understanding and access to information about its use of animals(3); it vigorously defends the most heinous and ethically questionable experimental using animals(4); it circumvents the law(5); it works to exempt itself from the law(6); and it works around-the-clock to attract more federal and private dollars for more experiments on more animals. It comes as no surprise to anyone moderately informed about the university’s dark history in this area that their claims about the “forums” are just more of the same. One of the sillier bits of conversation that occurred at the Kaufman “forum” was the vivisectors’ claim that they would like to house animals under more humane conditions, but they just don’t have money to do so. They said that people who care about the monkeys ought to be asking the NIH or Congress to give them more money, so that they can enlarge their facilities and give the monkeys more space. The only reason the monkeys are kept in such tight [they didn’t say mind-numbing] quarters, they lamented, was the lack of funding. Apparently, they blame someone other than themselves for the number of monkeys at the primate center. This is like the woman living in a school bus with umpteen dogs, cats, four goats, a donkey, and seven parrots arguing that it isn’t her fault that she can’t give the animals more room. (1) Many examples could be given, but the most egregious might be the constellation of lies surrounding the monkeys housed at the Vilas Park Zoo. Multiple written promises made by the university not to harm the monkeys were routinely and secretly broken; a decade later, the primate center director was still lying about their lies to the public. (2) The current series of “forums” is a good example. In the four opportunities to explain what is done to the animals, the university chose not to reveal any meaningful details. A stronger example is the extreme coordinated effort to derail Res 35. (3) The most straightforward case among many examples is probably their shredding of nearly fifteen years of videoed experiments on monkeys to keep them out of the public eye. (4) Only two countries still allow experiments on chimpanzees: the United States and Gabon. The university has convinced US representative Tammy Baldwin not to become a cosponsor of the Great Ape Protection Act because, she says, they worry that if experiments on chimpanzees are banned, where will it all end? They might see a reduction in their obscene access to federal tax dollars. (5) Again, many examples could be cited. An ongoing example is their pattern of delaying their legally-required responses to open records requests, sometimes by many months. They claim that they don’t have the staff necessary to fulfill the requests within the time frame stipulated by the state attorney general’s office. But they could hire one or two people to do this if they cared about sharing information with the public and complying with the spirit of the law. 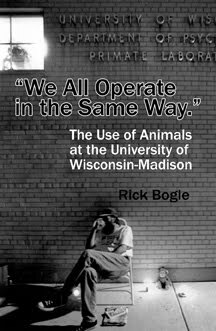 (6) In 2010 through 2011, after being caught in years-long series of experiments that were clear matter-of-fact violations of Wisconsin’s anti-cruelty laws – killing animals by means of decompression, and staging fights between animals – the university simply told its lackeys in the Wisconsin legislature to exempt anything it might care to do to animals from the state’s anti-cruelty laws, and they did. Friday, September 17, 2010: Who killed Res 35? Monkeys in Dane County: Is the use of monkeys ethical?